It was not your ordinary Seattle day. Almost 8,500 runners lined up at the starting line near Seattle Center, braving temperatures below freezing for the 2014 Seattle Marathon. Just one day before, the city woke up to a thin blanket of snow. Rain in November? Sure. But snow? It felt too early. On top of that, Uli Steidl, ten-time winner of the Seattle Marathon, was nowhere to be found. Basically, it was anyone’s race. And Shaun Frandsen made it his. With icicles on his beard, he crossed the finish line with a time of 2:34:21, winning the 2014 Seattle Marathon almost three minutes ahead of the second finisher. In the women’s category, Sophia Liu blew away the competition. Her time of 2:57:30 beat the second-best time by nearly 12 minutes. The training certainly paid off for both finishers. 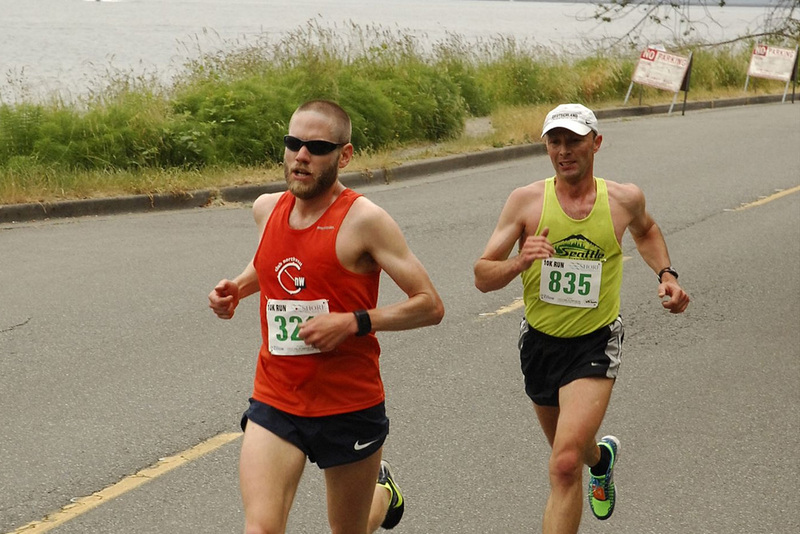 Frandsen was able to take the lead between mile 11 and 12, throwing in a long surge at Seward Park to break away from the pack. “I knew that if I could get enough space between me and them before the hills, then I had a good chance to maintain [my lead] for the win,” he says. And from that point on, he was completely out of sight of the guys trailing him. For Liu, the race didn’t go as smoothly. Liu was running for one person — herself. “I wanted to compete only against myself — a gift for graduating,” says Liu. And what a gift it was. “When I entered the stadium, I started to get excited. I knew I would cross the ribbon for the first time. It was such an awesome feeling,” she explains. Frandsen was excited well before the finish. With six miles to go, he ran through his favorite part of the race — Interlaken Blvd. With their first-place finishes, Liu and Frandsen are definitely looking to the future. Liu is eyeing the Seattle Rock n’ Roll Marathon in June, and Frandsen is considering a major race in New York, Boston or Chicago. Congratulations to all the winners and participants in this year’s chilly Seattle Marathon! And whether you’re training for another race or just running for your health — keep up the good work. Photos courtesy of Shaun Frandsen.